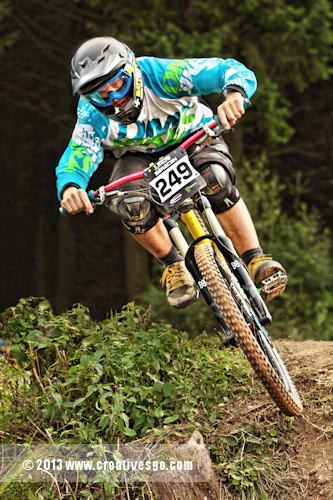 I took this image a couple of years ago at a downhill mountain-bike event near the Welsh border. It’s a fantastic sport to watch and you can’t help admiring the courage of the ladies and gents who race to the bottom of a very steep hill in the quickest time possible. I love to photograph and film most cycling activities but I do think this is the most dramatic of all the two-wheeled disciplines. The secret to any good sports image is to find a spot where you see ‘the peak of the action’. In other words, somewhere the sports-people are doing something really interesting like jumping, turning, banking or in this case, dropping off a steep bank. I stopped here because the riders looked great as they guided their bikes off the edge and down along the course besides me. Having decided this was a good spot, I picked a point in the scene that I felt the riders would be doing their ‘peak of the action’ thing and framed up on that point. However I also considered what the background looked like. It’s a common mistake amongst many new photographers where they ignore the background. It should be the first thing you think about as generally you want a destraction-free background to put the focus (no pun intended) of the image squarely on your subject. As I wanted a nice, tight composition I used the long end of my 70-200mm and used the AF. The camera was a Canon 5D mark II which doesn’t have the best AF system in the qorld but it got it right enough times for me to get home satisfied I had some good shots. What I set here would decide how the final image will look. If I want blur to feature I need to set a slowish shutter of say 1/30th but, being as I’m shooting almost head-on, going for blur would probably look rubbish. I could pan the camera with the riders as they go past but that would mean finding an alternative location and as I was happy with this one so I decided to stay here. So, I need to capture the riders coming over that drop, who are moving very quickly. I have no choice but to use a fast shutter speed to ensure I freeze their movement completely. I can’t remember what speed this was shot at but it must be at least 1/500th or perhaps faster. There’s still movement in the wheel if you notice. 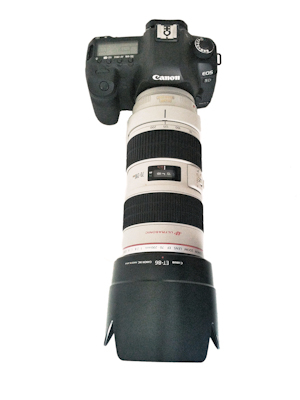 The aperture is likely to be about f2.8 or f4 to give me a blurred background. This reduces the depth-of-field greatly but I like that as I am a big fan of blurred backgrounds! After setting up it’s then a case of waiting for the riders to come through and taking shots of those that look like they mean business. Not all the riders come down the course with enough commitment to make for a good shot. It’s generally the more skilled riders who have the technique and ability to make the moves that look good in a photograph. Even then, their attire might be quite dark or boring. I look out for brightly coloured riders where the colour will add much to the final image. Sometimes I manually focus on a point and wait for the rider to pass through that and take the shot, That way I’m not relying on the camera to get the focus right. It’s a tricky technique to get right though! You don’t always get them bang-on sharp. If you have any questions about this please add a comment and I’ll reply as soon as I can.